PRODUCT ALERT: Electronic readers are now available for quantitative monitoring of toxic gas exposure in industrial, commercial and military settings. ChemSee’s has available small, lightweight badge detectors for detecting exposure to a Vessicants such as Mustard Gas and Lewisites as well as Organo-Phosphorous Nerve Agents. 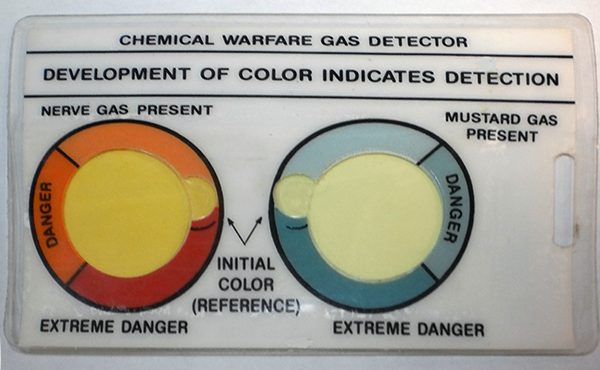 All of API’s dosimeters indicate detection by a simple color change. 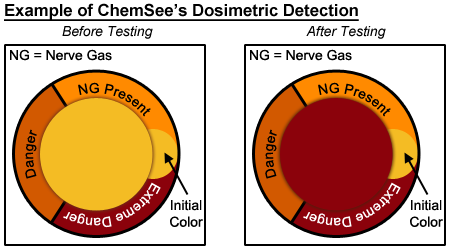 Estimation of the exposure dose to warefare chemicals can be done by using an Electronic Reader by visual color comparison. The detectors can be fixed to a person’s collar or pocket or placed in specific area to monitor local exposure levels. The detectors can be visually compared or read with the EYAL™ Reader multiple times throughout the day to ensure exposure levels comply with government regulations. 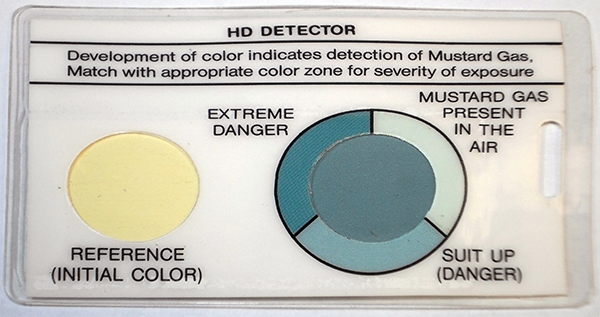 The color on the center of the dosimeter can be visually compared to the reference colors pre-printed on the cards to estimate the danger/exposure.